All the clocks produced at Lepper, are made to your specifications. If you are interested in this clock and want to order or have a question, then fill in the Form below and Lepper will certainly get back to you with an answer to your request. Beveled glass and polished brass capitols. Exclusive clock with Black Forest Kieninger movement. With quarter-hour silence. Similarly, auto night time silence possible. Pendulum and weights in polished brass . 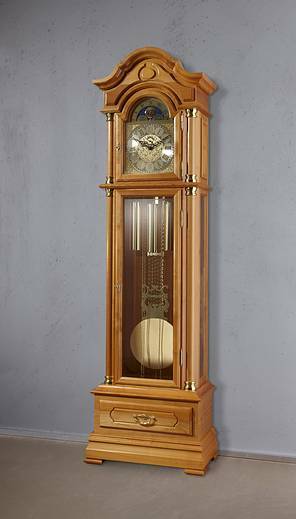 The clock is also available in oak or walnut stock.